Do you have a book that you tend to go back to time and time again? 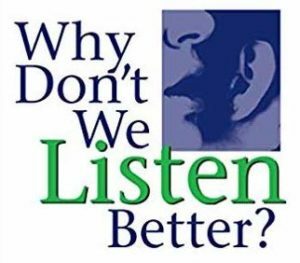 Jim Petersen’s book, Why Don’t We Listen Better?, is one where I find so much inspiration. In college I majored in Organizational and Interpersonal Communication. After I graduated most people would ask, what kind of major is that? Learning to listen with sincere interest to others is a powerful tool, a tool that more of us should learn how to use. Listening for understanding connects you to people like nothing else. One of the reasons I love Why Don’t We Listen Better? is that from the first page you start to learn and understand fundamental listening skills, as well as some of the communications traps that are waiting for us. This book is full of techniques and tips and you can discover a few pages at a time, then try the new technique at the next opportunity. In the first two chapters you’ll learn two techniques, acknowledge and repeat accurately, that you can start to use almost immediately, especially if you have children. When I first discovered this book over ten years ago I was delighted that so much that I teach (and more!) was conveniently in one place. With each book there are Talker/Listen Cards that I consider one of the best innovations in practicing personal communication. The cards are about the size of a business card and fold in half to create a tented message. On one side the role of the Talker is defined as “I’m most bothered. I own the problem.” The goals of the Talker are also given; to share my feelings, to share my thoughts without accusing attacking, labeling or judging. On the other side the role of the Listener is given as “I’m calm enough to hear. I don’t own the problem.” The goals of the Listener are to provide safety, to understand, to clarity without agreeing, disagreeing, advising or defending. Talker vs. Listener. Sounds like a communication challenge, right? This book will give you to tools to get to win/win in your personal communications. Listening connects you to people like nothing else. Learn how to listen better by reading this book and following the many easy to understand and easy to follow techniques. Your children will benefit. Your spouse will benefit. Your coworkers will benefit. It’s what the world needs now.